KEYSTONE — Headlights beam through the swirling snow as the 5 a.m. ski-area social hour kicks off. The dogs are a yipping tangle as a gaggle of underdressed skiers click into their skinny skis and start climbing Keystone’s perfectly groomed River Run trail. By dawn, more than 50 skiers are climbing Keystone ski area, hugging the treeline as growling groomers comb the fresh snow. 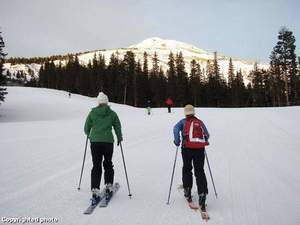 BRECKENRIDGE, Colorado — Breckenridge Ski Resort officials are asking for cooperation from a rugged, growing breed of skiers who prefer hiking to riding ski lifts, as the resort undergoes base-area construction and balances business operations with after-hours access. Dozens of so-called “skinners” flocked Thursday to Breckenridge Town Hall, where resort officials discussed restrictions, rules and revamped parking plans.